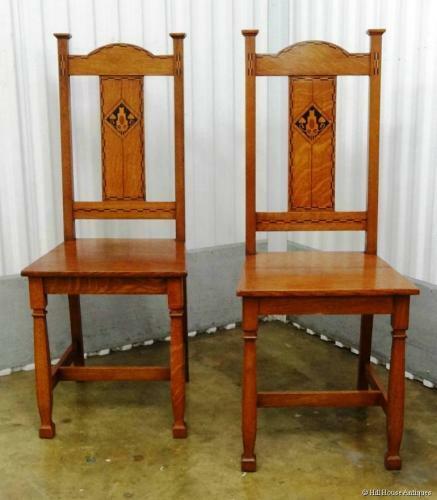 A superb & rare pair of Arts & Crafts inlaid oak hall chairs by Shapland & Petter of Barnstaple, very much to a Mackay Hugh Baillie Scott design with the ebony inlays. These chairs have historically always been categorised (also in previous regarded reference books) as designed by Baillie Scott and made by John P White of Bedford. Some confusion has arisen; as a settle designed by Baillie Scott for John P White with the same inlays, also appeared in a Wylie & Lochhead of Glasgow catalogue (and it is known that Shapland & Petter supplied designs to Wylie & Lochhead). These chairs also appear in Wylie & Lochhead catalogues. Illustrated in the recent Shapland & Petter book p103, as well as in Victorian & Edwardian Furniture & Interiors by Jeremy Cooper pl 678 (listed there as Baillie Scott for JP White). Approx 41.25" high, 18.25" height to seat.